The “Document System” provides an overview of all the texts, PDF files, tables, pictures and media files of your project. You also have the option of organizing these documents in document groups, which act as folders. 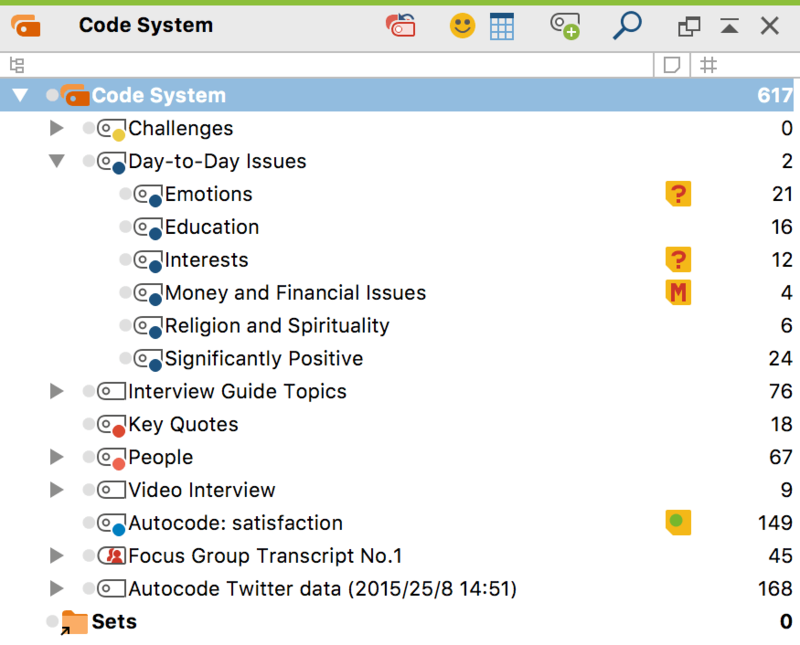 The “Code System” displays all the codes, subcodes and code memos along with the number of associated coded segments. The “Document Browser” displays one of the documents from the “Document System”, where it can then be worked on. You can highlight, edit, code, create links, or attach memos in this window. Geo-Links are also displayed in the “Document Browser”. The “Retrieved Segments” window is a results window. Here you can display a selection of coded segments (Retrieval). All four windows can be individually displayed or hidden so that you can control the arrangement of windows on your screen and optimize your work space. Click on one of the the four window symbols in the Home tab to hide or show one of the main windows. You can close the windows by clicking on the appropriate icon in the upper-right hand corner of each window. Next to the close icon, you also have the option of clicking to maximize the window to its largest possible size. Note: At least one window must be open, which means it‘s not possible to switch off all four windows at the same time. The size of each window in comparison to the others can be adjusted as you wish by clicking with the left mouse button on a border and dragging it in the appropriate direction. Top left: The three column layout for wide screens. The “Document Browser” is found in the middle and “Retrieved Segments” in the third column on the far right. Top right: Alternative three-column layout with the “Document System” and the “Code System” on the right side. Bottom left: The two-column layout with the “Document System” and the “Code System” on the left side. Bottom right: Alternative two-column layout with the “Document System” and the “Code System” on the left side. 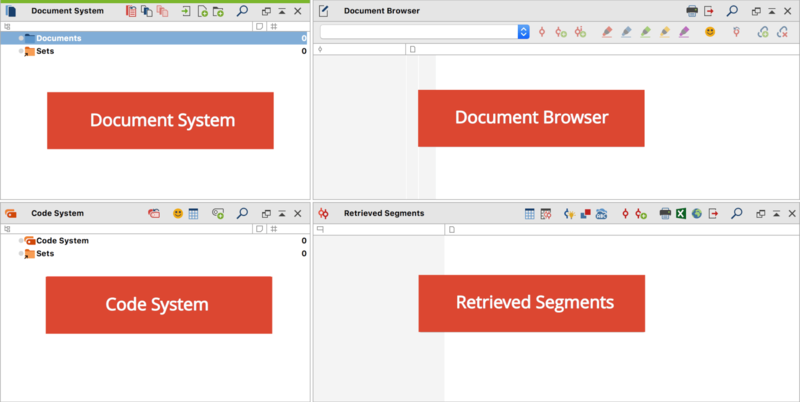 When coding a document, it is sometimes helpful to close the “Document System” and “Retrieved Segments” window, so the “Code System” and “Document Browser” are larger. The “Document Browser” can then be made even bigger by dragging the border in the direction of the “Code System”. The same is recommended for retrieving coded segments, the “Coding Query” function. The “Document Browser” window is often not required and can be hidden. Sometimes you want to see both the coded passage and its context. The easiest way to do this is to open the “Retrieved Segments” and “Document Browser” windows next to each other. If you then click on the source indication in front of the segment, the surrounding context will be displayed the adjacent window. There are several tasks for which specific window arrangements can be useful: for example, in the case of selective searches for coded segments based on variable values, it may be useful to display the “Document System” in the left window, to see which documents are currently selected, and the “Retrieved Segments” in the right window, so as to immediately check the results. The four main windows can not only be switched on and off independently, they can also be expanded to full screen by clicking the icon in the upper right corner of the window. This can be useful if you want to reorganize your category system and make the whole screen available for this.